« A Looming Generational Conflict? 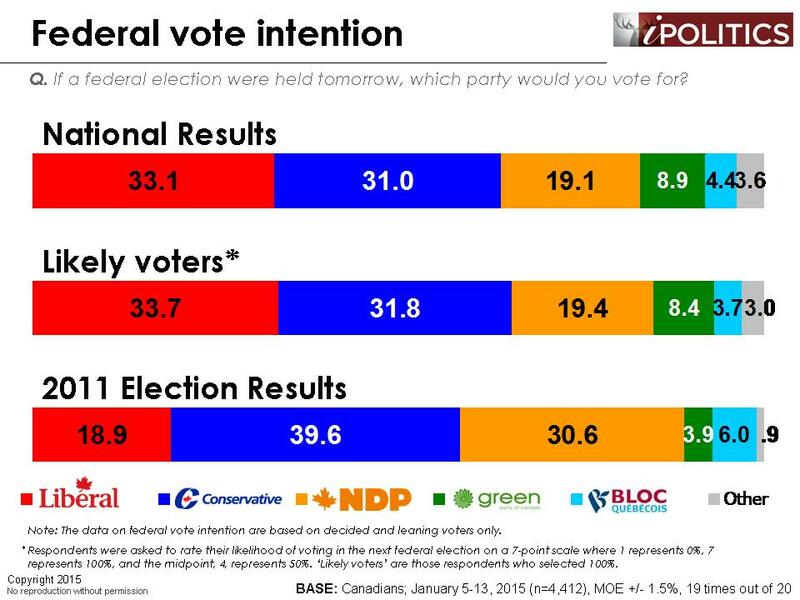 [Ottawa – January 16, 2015] From a random probability sample of some 4,400 Canadians, we would be hard pressed to draw any conclusions about what party (or parties) will hold power next November. 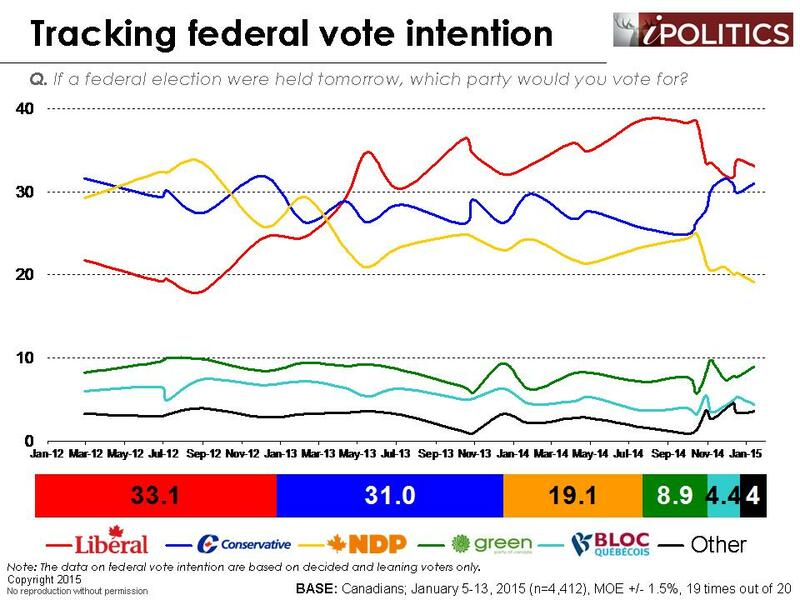 The Liberals have a small but significant lead, and they have led in every poll we have conducted for well over a year. They have a very important lead in the critical Ontario market and they have strength throughout the country and with some key voting groups like the more educated the huge boomer cohort. They seem to have recovered from the security bounce which propelled the Conservatives back into a race that they were simply out of in the early fall. The NDP are slowly but inexorably falling out of favour as the progressive choice to depose the Harper government and the longer term structural forces on values, the economy, and democracy are in their favour. 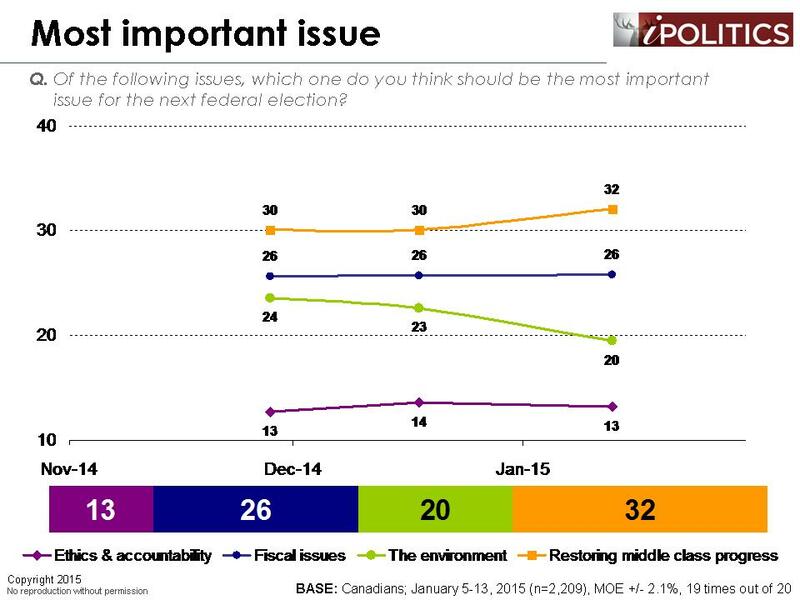 So are the Liberals ticketed to a return to power in the fall (or sooner)? Not so fast! The Conservatives have rebounded from a near-death experience and rode the wave of a rare popular piece of policy with the ISIS mission, a sound handling of the shooting episode, and a wave of communications on concrete provisions to help key family segments to near parity. The extremely unpopular Stephen Harper is only mildly so now and the base that provided a majority in 2011 is returning to the fold. Strikingly, the critical senior vote has shown a net 20-point turnaround and is now squarely in the Conservative fold. On top of this, another propitiously timed security tragedy in France has been used as a platform for the government to establish the need for a sterner approach to security and reinforce its intrinsic advantage as the safe hands in troubled hands. Along with the advantage of a well-resourced and practiced political machine and the 31 points (highest achievement in two years), all of this seems to point to a path to a fourth victory for Mr. Harper. Once again, not so fast (although timing and speed of action may be a critical factor here)! What is mildly surprising and quite important to note is that the very real security bounce that had put the Conservatives in a virtual tie with the Liberals in late November seems to be weakening, not strengthening. Furthermore, the somewhat florid language about a jihad against the West and the need for even further powers has not only failed to advance the Conservative cause, it may be that this bounce has been exhausted and the latest plea for even more powers is falling on deaf voter ears. In fact, the more we look, the election will be not about security, but about the economy and perhaps the related question of the role of the federal state in dealing with the economy. According to this test, it is the economy that wins out by a slight margin over the nearly equally important social issues (and social issues are actually slightly more important with most likely voters). We note that the boundary between social issues (such as pensions and education) and economic issues is increasingly murky. There are large gender and regional splits, but these are the dominant issues. Looking at another variation, we see that in this framing, the issue of restoring middle class progress – a somewhat different, longer-term framing of the economy – is dominant. 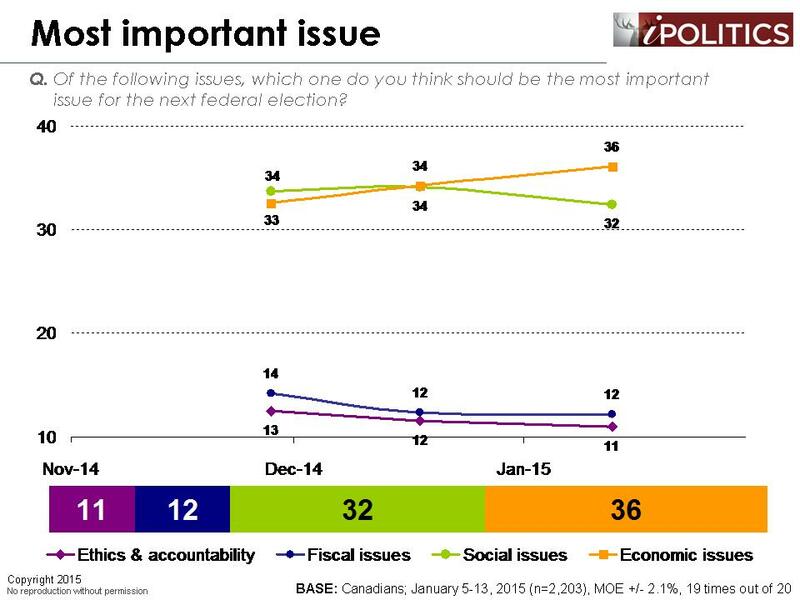 It is notable just how strong this issue is in Quebec, among the more vulnerable, and among Liberal supporters. The issue of the economy dominates, but whether it is framed in the shorter or longer term provides a different picture. This finding coincides with a very large paradox in outlook on the economy which shows that there are quite different takes depending on whether we are looking at the shorter term or the longer term; whether we focussed on preserving small but eroding jobs or taking on the bigger problem of stagnation and gradual but steady erosion in the middle class bargain. In this latest survey, we updated our tracking on economic outlook. 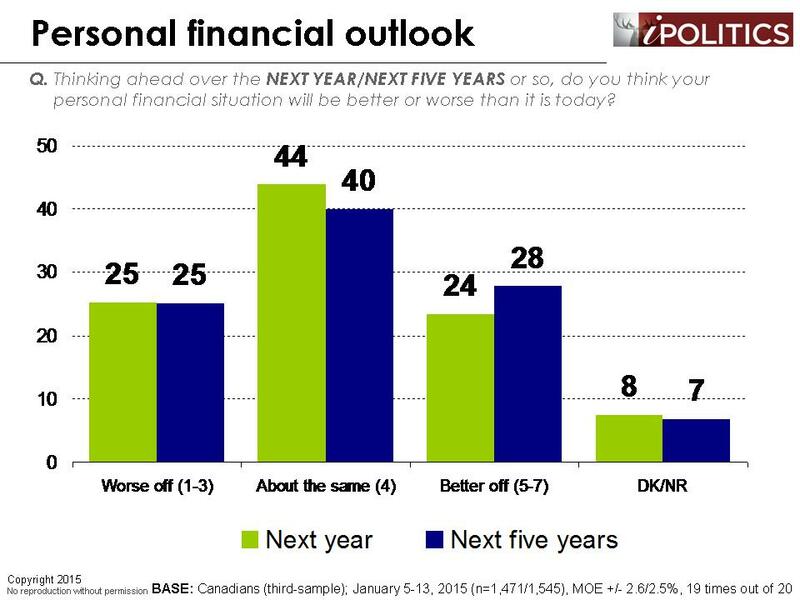 Overall, Canadians are divided on how the future will pan out, with the general impression being that things will stay more or less as it. Looking at these results in a historical context, however, these are the worst-ever results and they contrast sharply with attitudes from just a few years ago when optimism decisively outstripped pessimism. 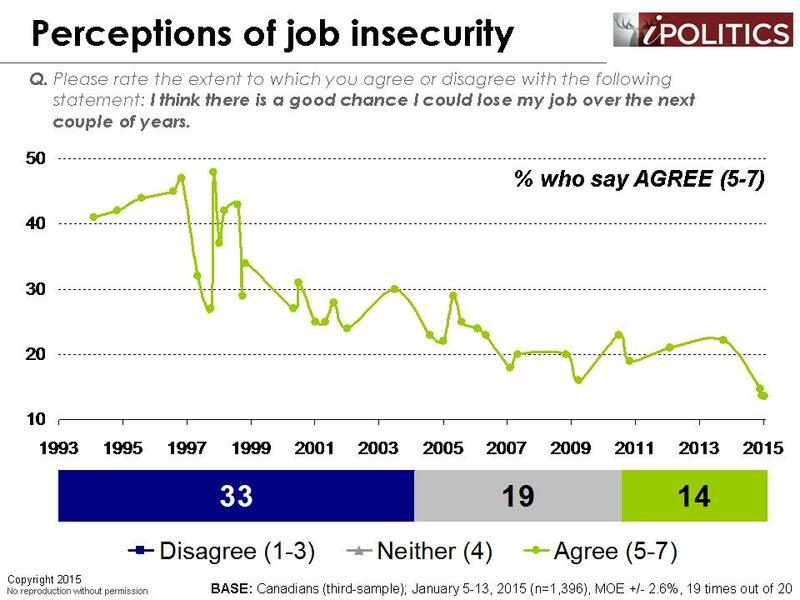 Yet in something of a contradiction, Canadians are highly confident regarding their job security, with just one in seven expressing concerns that they may lose their jobs over the next couple of years. It is not clear why Canadians hold such divergent views on the economy and the labour market, but it may be linked to a growth in non-standard employment (e.g., part-time, contract, self-employment), where Canadians are increasingly holding lower-paying jobs with poorer benefits. Another explanation is that jobs that used to produce optimism are no longer doing so. Canadians may feel that having a bad job is better than nothing, but they do not feel particularly hopeful about the future. In game theory, this phenomenon is referred to as minimax, where Canadians, faced with an uncertain labour market, accept menial work in an attempt to minimise their maximum loss, which is their job. If this theory holds, the huge tensions across a largely miserable outlook on the economic future and a more sanguine sense of job security may become a critical factor for the election. Canadians are now faced with a tough choice between: 1) not rocking the boat and hanging on to have they have (even if it is stagnant and may be leading to a progressively worse future); and 2) risking a bold new approach in the hope that a better future is once again possible. Further complicating this is the partisan divide that saw the Conservative constituency seeing an economy which worked decidedly better for them than the other roughly 70% who had a much less mirthful outlook on the economy. Conservative supporters are far more likely to say they have moved ahead over the last 25 years and they are considerably more apt to say that their financial situations are likely to improve in the short-term. Over the long-term, Conservatives predict a steadier path where things will stay more or less as is, compared to the downright gloomy outlook of other party supporters. Notably, however, relatively high levels of pessimism tend to straddle partisan lines as no one feels very confident in the longer term future. So what does this all mean? 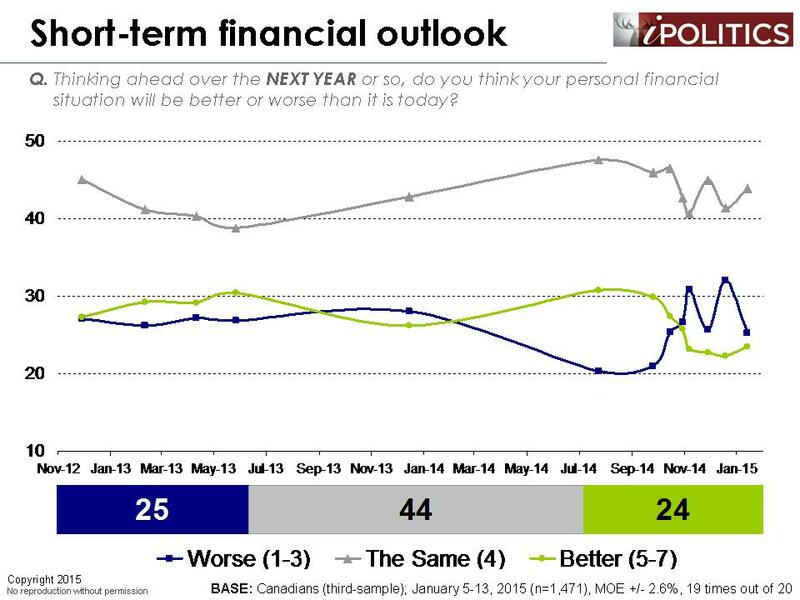 It means that fundamentally different views on the economy are critical to how one will decide in Election 42. Will the status quo – with stable if increasingly crappier jobs – be seen as preferable to a search for a new approach? Will austerity, tax cuts, and minimal government seem to be the continued right choice? How about that bet on Canada as a carbon energy superpower? With oil prices plummeting, Keystone on the verge of being vetoed, and Alberta on the verge of recession, how will that bet for the national economy look? The promise of fully funded family goodies may look less attractive against a public treasury where a surplus looks increasingly implausible. Yet despite the power of the fears about the end of progress and the death of the middle class bargain, it is uncertain whether the fears of rocking job security will be worth the risk of trying a new approach. The majority of the public who remain unconvinced of the effectiveness or fairness of current federal economic policies are going to be anxiously watching this space as they await some clearer proposals that a better and fairer economy is once again possible. The field dates for this survey are January 5-13, 2015. In total, a random sample of 4,412 Canadian adults aged 18 and over responded to the survey. The margin of error associated with the total sample is +/-1.5 percentage points, 19 times out of 20. 2 comments to It’s the Economy, Stupid! …but which one? Social programs have the highest priority for me, particularly health care and education. Education and training is imparative to maintain, expand economic growth as expansion into knowledge based industry is Canada’s opportunity for diversification. We can not compete in low value manufacturing nor should that be the focus if we want to maintain social programs into,the future. Two of Britain’s great prime minister are father and son: William Pitt the Elder and Pitt the Younger. Pitt the Elder laid the foundation of the British Empire by driving the French from India and Canada. Following in his footsteps, his son, William Pitt the Younger became prime minister at the tender age of 24. He was ridiculed for his youth and lack of experience. A popular ditty commented that it was “a sight to make all nations stand and stare: a Kingdom trusted to a schoolboy’s care.” But he proved to be equally successful. He reformed the Indian administration, advocated parliamentary reforms, abolished the slave trade. He also kept Britain out of the turmoils of the French Revolution. Justin Trudeau shares many traits with Pitt the Younger. Like younger Pitt, he is the son of one of Canada’s great prime ministers : Pierre Elliott Trudeau. He is also charismatic. Although not as young as Pitt the Younger, he is young enough to satisfy the public yearning for change after a decade of Harper rule. As such, he is likely to be elected in the coming election. Time for change and renewal has come. It will be good for democracy which calls for change.